It’s 2001 in Yesterland. 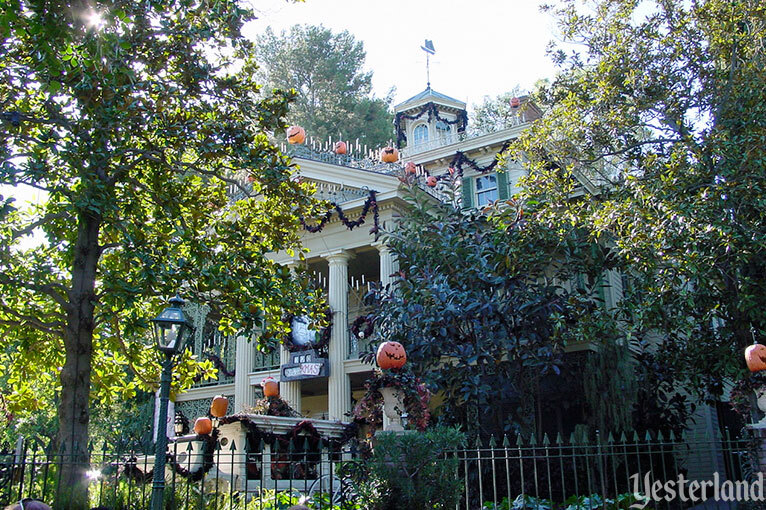 For the first time ever, the Haunted Mansion has been transformed. It’s not just decorated on the outside. It’s practically a new attraction on the inside. 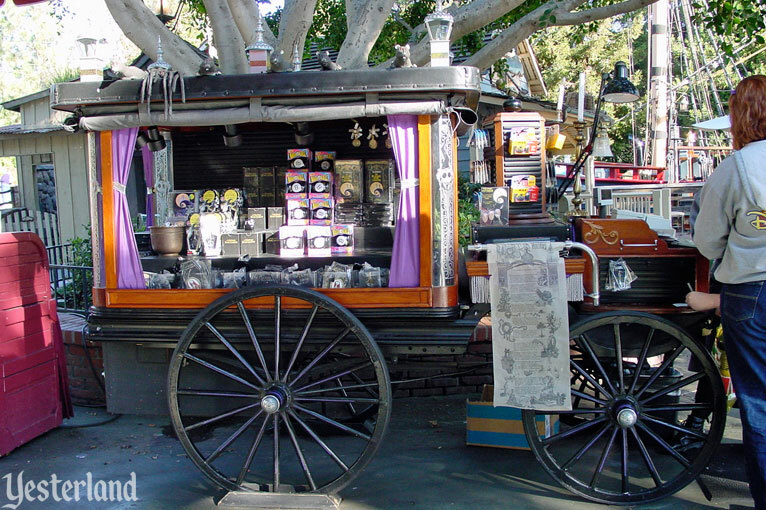 Your Doom Buggy is now called a Black Christmas Sleigh. You’ll travel on the same track, but many of the familiar show scenes are now completely different. The ballroom hosts a Christmas Ball. Weird presents fill the attic. 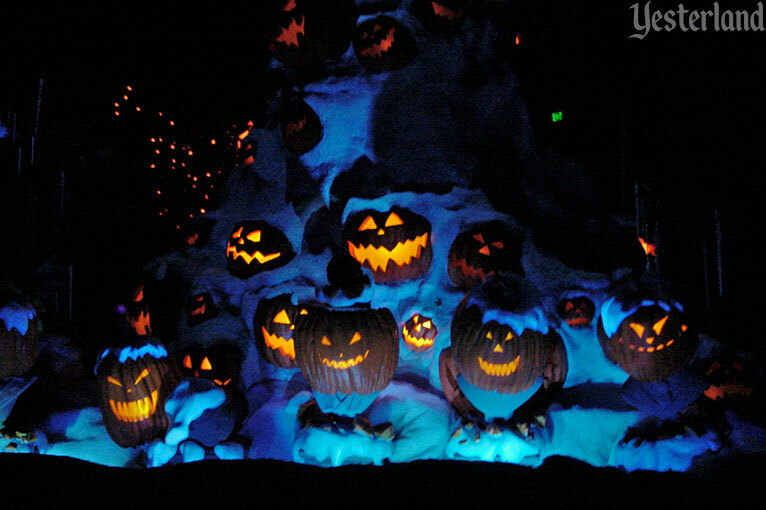 The graveyard, where jack-o’-lanterns now sing, is bathed in snow. 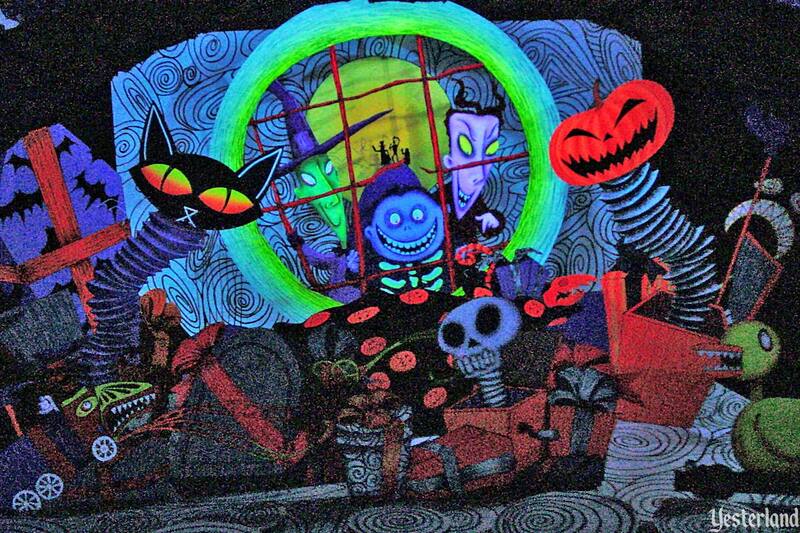 And Oogie Boogie’s henchmen—Lock, Shock, and Barrel—have replaced the hitchhiking ghosts. Did you like that? If so, come back a year from now. 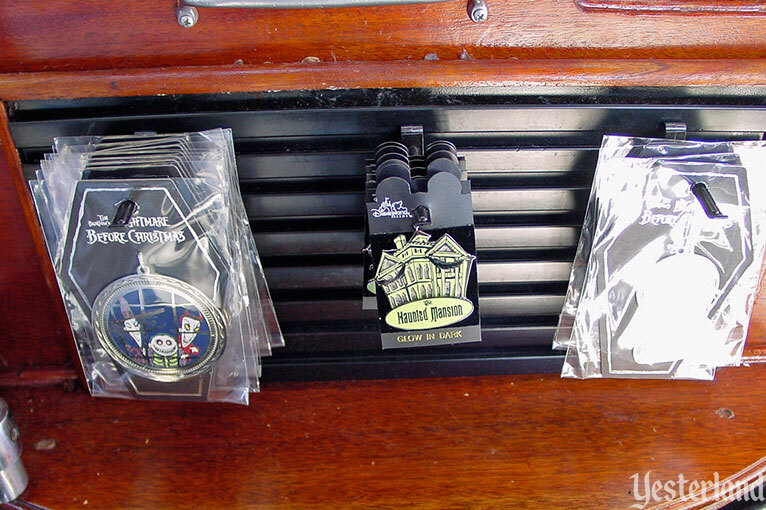 If not, wait until the ride reopens in its original form in early 2002. The photos above are all from 2001, but the story begins in 1982. Tim Burton, who would later become a successful director of quirky live-action movies—including Pee-wee’s Big Adventure (1985), Beetlejuice (1988), and Edward Scissorhands (1990)—was an animator at Walt Disney Productions. 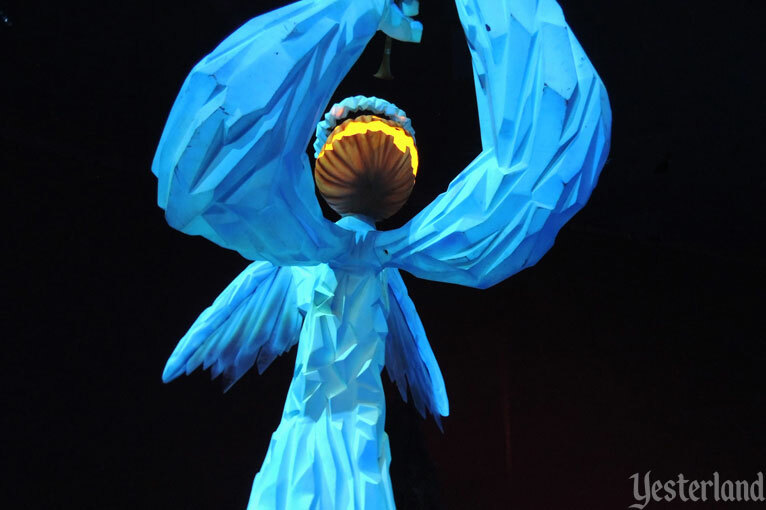 He wrote a poem, “The Nightmare Before Christmas”—reportedly inspired by seeing a store transform its displays from Halloween to Christmas. 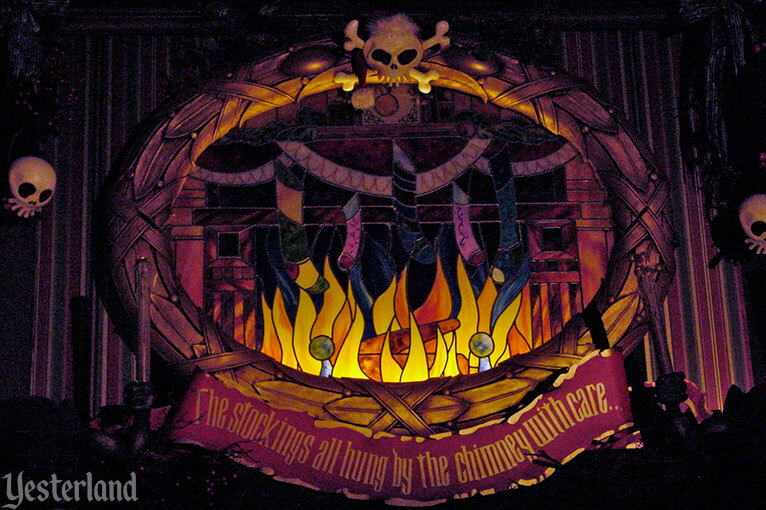 Burton’s poem was the seed for the unusual animated feature that The Walt Disney Company would eventually produce. “Nightmare” is about pumpkin king Jack Skellington; his ghost dog, Zero; and the other weirdos—three ghouls are named Lock, Shock and Barrel—who live in a place called Halloweentown. The ghouls find Christmastown, kidnap Santa Claus and take him to a big meanie named Oogie Boogie who wants to eat him for dinner. The music was written by Danny Elfman, the lead singer of rock group Oingo Boingo, who also composed the music for the “Batman” movies. The movie wasn’t drawn by Disney’s animators but instead was filmed in “stopmotion” animation, a painstaking process in which stick figures and puppets are slowly moved about on sets and shot frame by frame. A typical bit might take animators three days to shoot yet last only about five seconds on screen. “Nightmare,” which took nearly three years to produce, will be released under the Touchstone Pictures banner, not the family-oriented Walt Disney Pictures logo. Disney says the film cost just over $20 million to produce, far less than other animated films. By using the Touchstone brand, Disney would distance itself from the ghoulish musical with creepy characters. The Disney brand was reserved for family movies such as Aladdin (1992), The Lion King (1994), and Pocahontas (1995). 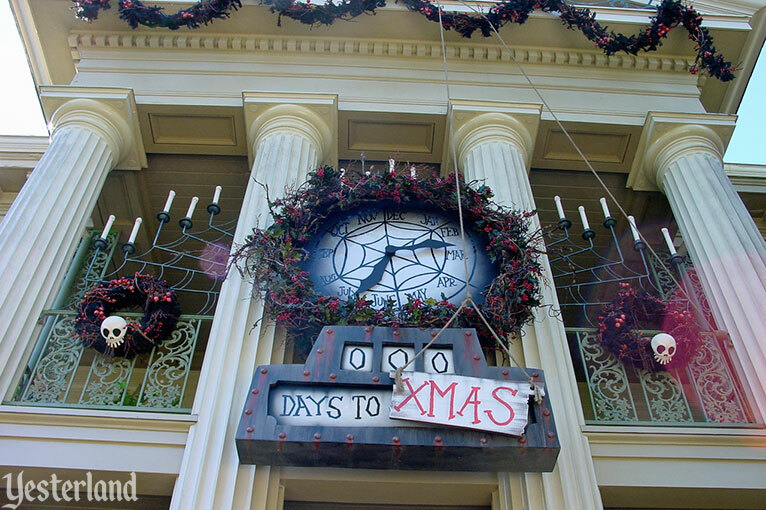 Given its production cost, The Nightmare Before Christmas was a success in its initial theatrical release, grossing a respectable $50 million. It is now no longer Disney’s illegitimate child but their proverbial favorite son. The reissues have proudly reclaimed the Walt Disney Pictures banner, while the film itself is now a cornerstone of Disney’s marketing efforts during a key shopping season. It is now considered not a potentially dangerous horror film to traumatize young children, but rather an ideal first horror film for a generation of youngsters. 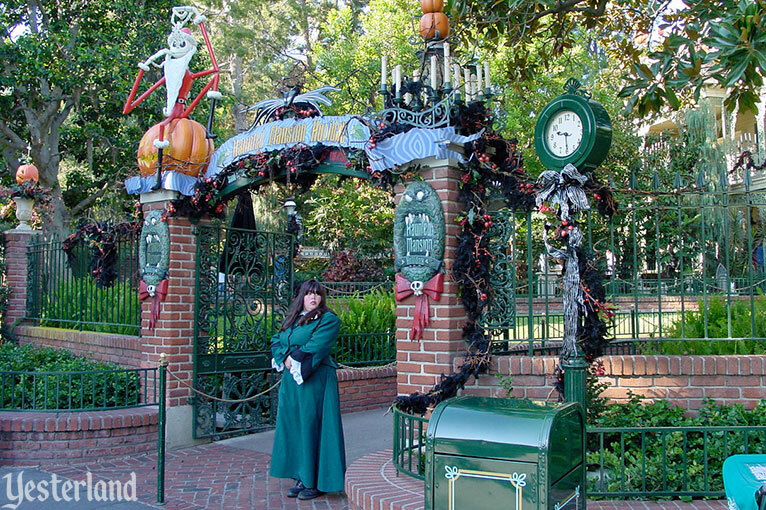 Eight years after hitting movie theaters, The Nightmare Before Christmas moved into Disneyland’s Haunted Mansion on October 5, 2001. 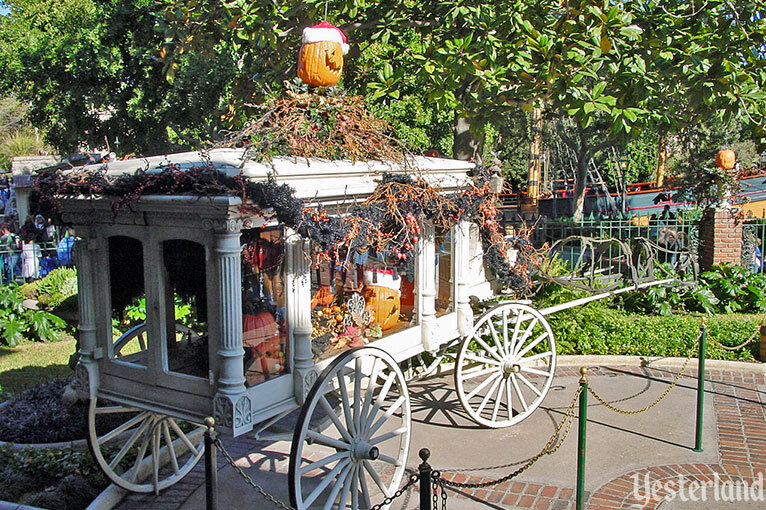 It was a holiday overlay in the tradition of Country Bear Christmas Special and “it’s a small world” Holiday. 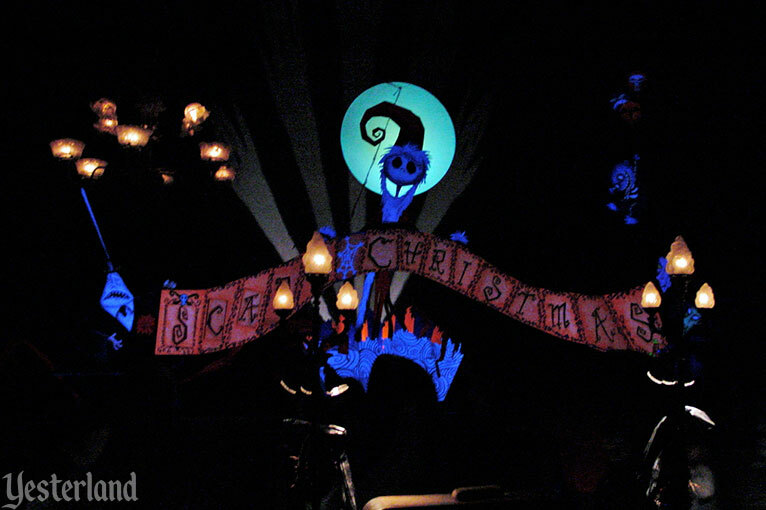 “Tim Burton’s The Nightmare Before Christmas” teams up with Disneyland® park’s Haunted Mansion on October 5, to kick off a fantastically fun holiday event and a whole new reason to make the Resort your holiday haunt this season. 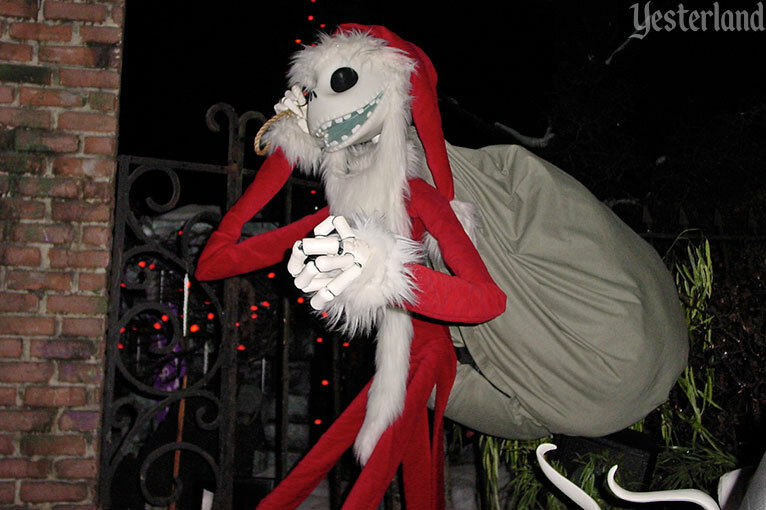 “Tim Burton’s The Nightmare Before Christmas” star Jack Skellington brings his vision of the holidays to the world-famous Haunted Mansion, transforming the attraction into a festival of the wild and wacky, the kooky and creepy. 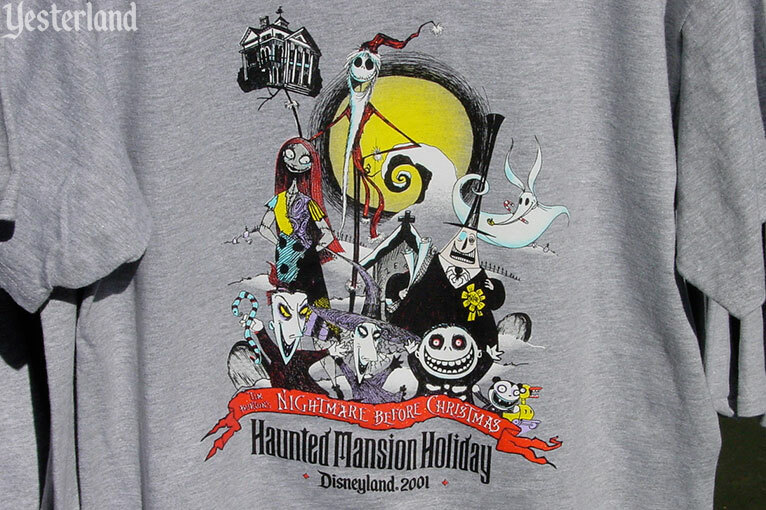 Complete with its own unique soundtrack, the Haunted Mansion Holiday features Jack’s new take on the old favorites, from new décor on the Mansion’s exterior and the transformation of the famous ballroom scene into the ultimate Christmas Ball, to the finale scene through the Mansion’s graveyard, now covered in ghostly white snow, where playful ghosts are making their own unique Christmas trees. See for yourself what happens when two holidays collide, but be warned, the results are somewhat ho-ho-horrific! 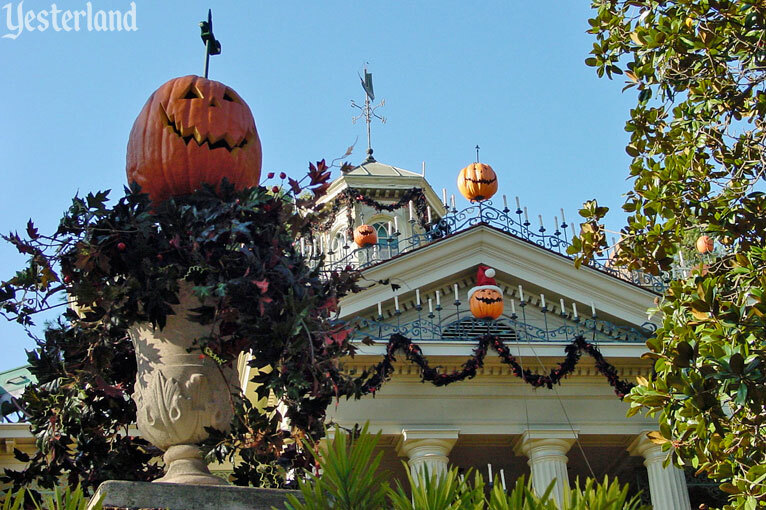 The Holiday version of Haunted Mansion has returned the fourth quarter of every year—always with clever, new enhancements. 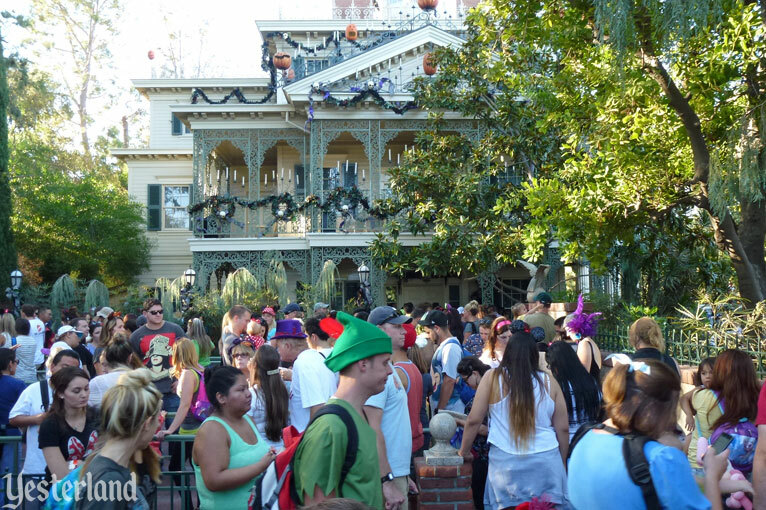 In 2015, when Disneyland celebrated its 60 anniversary, it was the 15th year for Haunted Mansion Holiday. 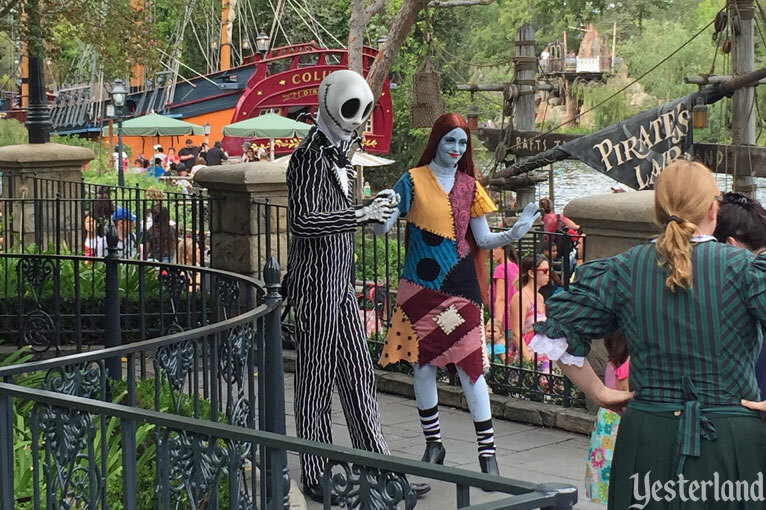 No longer banished to the Touchstone Pictures realm, Jack and Sally are now Disneyland characters—just like Mickey and Minnie.